The remaining 75% pending bonus corresponds to a 20% cash back deal – THIS IS ONE OF THE BEST BONUSES ON THE MARKET. 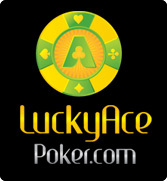 Lucky Ace Poker is one of the leading sites on the shared Pacific Poker Network which has its head quarters and game servers in Gibraltar. The Pacific Poker network does not allow US players. The Pacific Poker network, with its average of 1600 cash players at any given time, comes in 13th place out of 32 networks on Poker Scout when it comes to player traffic. This means there’s more than plenty of players to win $ from. Free seats into 7 (seven) 500$ Depositor’s freerolls upon your first deposit. A free seat in Saturday’s 1000$ depositor’s freeroll if you deposit more than 50$ in the given weak. This a weekly promotional offer. You earn reward points based on the number of status points you accumulate by raking on cash games (contributed rake) and paying tournament fees. The higher your reward status is, the more reward points you earn from each status point you accumulate. Each reward status level gives you access to special freeroll tournaments as well as buyin tournaments where you can boost your reward status. The instant bonus has to be wagered 20 times in order for it and any winnings to be withdrawn. If for example your instant bonus is 100$ you need to wager 2000$ in order to qualify for a withdrawal. Every time you pay a tournament entry or make a bet on a cash table it counts towards your wagered amount. The pending bonus is cleared by a rate of 1$ for every bonus point and paid out in a lump sum once completed. You get 2 bonus points for every $ raked or paid in tournament fees. This means that the pending bonus corresponds to a 20% cash back deal. In order to cash out your pending bonus you also need to generate twice (2x) the pending bonus amount in rake. You have to clear your pending bonus within 30 days.